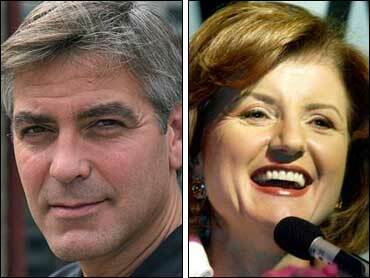 It's George Clooney versus Arianna Huffington in a standoff worthy of "Good Night, and Good Luck." In one corner, Oscar winner Clooney says he did not write a blog posted Monday on commentator Huffington's Web site, though he gave her permission to use a compilation of his critiques of the Iraq war from interviews with Larry King and London's The Guardian. "Miss Huffington's blog is purposefully misleading and I have asked her to clarify the facts," Clooney, 44, said in a statement issued Wednesday. "I stand by my statements but I did not write this blog." In Monday's profanity-filled posting, Democrats are faulted for muting their views and criticism of the Bush administration in the months before the start of the Iraq war. Huffington has denied any wrongdoing. A rebuttal on her Web site claims she and her staff initially compiled a "sample blog" for Clooney from his interview answers because he wasn't sure how a blog worked. Huffington said that after she sent Clooney the sample, a film publicist e-mailed her and three days later approved it, without any changes. "This was an honest misunderstanding," she wrote. "But any misunderstanding that occurred, occurred between Clooney and the publicist. We based our decision to post on the unambiguous approval we received in writing." Clooney's publicist Stan Rosenfield disagreed. "It's not a misunderstanding, it's misrepresentation," he said. "She knows what she was doing. She was saying to people that she had George Clooney's blog and was printing it. George Clooney does not make statements. He answers questions." Rosenfield said Clooney had requested an addendum of clarification to the posting. Clooney, who won a best supporting actor Oscar for the political thriller "Syriana," also garnered attention for 2005's "Good Night, and Good Luck," a film about CBS newsman Edward R. Murrow that Clooney directed and appeared in. Both films have been seen as critical of foreign and domestic policies.